An image from a multibeam sonar survey of an area approximately ten miles northwest of Bardsey Island reveals the wreck of the U-87 which was lost with all 43 hands on Christmas Day 1917. Historic wrecks around Wales’ coastline, such as that of a German submarine sunk 10 miles off Bardsey Island at the tip of the Llŷn Peninsula on Christmas Day 1917, are to play a part in assisting Wales’ growing marine renewable energy sector. The marine renewable energy (MRE) sector is developing technologies to capitalise on Wales’ excellent wave and tidal resource, to create sustainable energy. The researchers intend to include surveys of shipwrecks located around the Welsh coast as models for what might happen to any structures placed in the same or similar areas of the seabed. Sonar images of the historic wrecks, taken from the University’s research vessel, Prince Madog, will reveal how the tides and currents have removed or deposited sediments around the wrecks on the seabed. The oceanographers can learn how the presence of structures on the seabed can change how sediments are carried in the water or deposited, and over what sort of timescales. This research will also greatly benefit the heritage and tourism sectors in Wales by enhancing our understanding and appreciation of Wales’ extremely rich maritime history, associated with major conflicts of the twentieth century. The results of these surveys are already providing Bangor scientists with images of previously unexplored seabed at an unprecedented level of detail such as this area which includes the wreck of the U-87 which was lost with all 43 hands on Christmas Day 1917. The German submarine was rammed by a British naval vessel shortly after it had sunk a cargo vessel nearby. 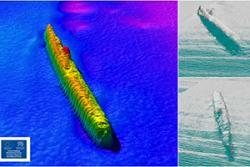 It is anticipated that results from such work will contribute to the overall aims and objectives of the potential HLF funded project ‘Commemorating the forgotten U-boat war around the Welsh coast 1914-18: Exploration, Access and Outreach’ led by RCAHMW. See also this story from the Royal Commissionon the Ancient and Historical Monuments of Wales.